April 2019 Member Spotlight: Traci Rhone, Executive Producer/Founder at Kingston5 Productions. 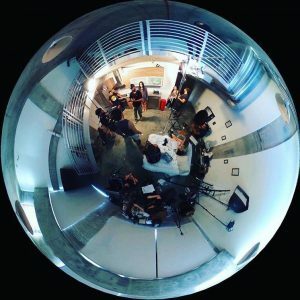 Kingston5 Productions is an Indie Film Production company in Miami, Florida, U.S.A. We are storytellers of truth and fate and want to inspire those around us; Our mission is to empower human beings to achieve their fullest potential. What impact does your organization have or make? We are committed to liberation and encourage counter culture systems that transform apathy into positive social change thru the production of the 7th Art. How does your organization make an impact? Kingston5 Productions produces independent feature films, short films and documentaries that focus on real people, real stories, and social situations that are often neglected by traditional media outlets. We truly want to make the world a better place. What would you like others to know about your organization? Kingston5 Productions is highly knowledgeable about the film industry. We seek serious investors to finance independent motion pictures and other media projects. How has C4SC impacted you, personally? C4SC has allowed me to make my reality, realities. How has C4SC impacted your organization? C4SC has been instrumental in nurturing and accelerating our growth by providing us with a variety of business support resources. It has given our organization a space to create, collaborate and meet as a group. The Center for Social Change is proud to have Kingston5 Productions as a member of the C4SC community. I joined the Florida Association of Free and Charitable Clinics as the Executive Director in late 2015. I have spent a large part of my career in the non-profit sector, particularly with health care focused organizations. The work, in particular, is important to not only me but my staff. Each one of us has experienced health care events or diagnoses that could have been catastrophic if it weren’t for access to affordable health care. At the association, I have the privilege to see that peace of mind extended to hundreds of thousands of Floridians yearly. Our 105 members are located from the Panhandle to the Keys and provide free and low cost medical, dental, vision, mental health and wellness care to some of our state’s most vulnerable populations. Just last year, our clinics provided care to nearly 230,000 Floridians, through 456,000 visits. Year after year I am amazed at the work our clinics do and I consider myself lucky to see the tangible impact our members have on communities statewide. The Center for Social Change is proud to have the Florida Association of Free and Charitable Clinics as a member of the C4SC community. Tell me about the problem your organization solves: Casa Valentina uplifts a population that is often forgotten: youth who turn 18 years old and “age out” of the foster care system, as well as former foster youth. With so many great organizations to support, why should people choose to support your organization? Oftentimes when I ask people what they think happens to youth in foster care on their 18th birthday, I get blank stares and the slow realization that they have never really thought about this question. When people think of “foster care” they often think of children under the age of 18, but very little thought is given to the youth who are never reunified or adopted, and are expected to face life on their own at 18. Most of us remember what it was like being 18, and how ill prepared we would have been to really face life on our own with no support system in place. Casa Valentina steps in to fill this gap. We provide not only the safe, affordable housing but the life skills needed. Our formalized curriculum focuses on the areas we have identified as being most critical to successful self-sufficiency: 1) education; 2) employment; 3) money management; 4) household maintenance; and 5) self-care. We are a system of support that shepherds them into thriving independence. If people are passionate about creating avenues for youth to really grow and thrive, Casa Valentina is a place that could use that time, talent, and treasure. What has been the most surprising thing you learned about your cause? Having had limited exposure to children and youth in foster care, I always assumed there was something in their family history where the parents made a mistake and lost their children as a result. What I’ve come to learn, and find surprising, is the various stories of our youth. For example, we have had youth whose family is loving and caring, and still intact, but they reside in their home countries. The youth were sent to the States in search of a better life as a minor and were placed in foster care. We’ve seen youth who chose to bounce around between friends’ homes because it was safer than being in their own home. There’s also a misguided notion that youth in foster care are somehow the same population as youth involved in the juvenile justice system, or that they must come from horrible trauma. I think the nuance of their stories need to be brought to the forefront of a broader narrative surrounding youth in foster care. Is there an achievement related to your cause that you are most proud of? What is it and why is it important to you? I’m most proud when we are awarded a grant because it shows me that there are partners in the community who value our work, and understand that youth 18-23 are just your average 18-23 year olds looking for their place in the world. Their potentials are worth investing in. When did you first hear about this cause or realize it was a problem that needed solving? I’ve been a Guardian ad Litem for years, so I have had some connection to the world of foster care, but most of my cases dealt with children and not young adults. It wasn’t until I came to Casa Valentina that I myself realized I didn’t know the answer to what happens to foster youth on their 18th birthday. What attracted you to this cause? Any youth development work is intriguing to me because I am in pursuit of anything where we can build a community we all want to be a part of. What inspires you? I’m inspired by my belief that we are put on this earth to serve our fellow man. At its core, humanity just wants to be loved, and we can most effectively show that through service. How did you know you had to get involved? I had a moment of realization that each one of us is given gifts & talents, and that those come with the burden to edify others. My position as Grants & Community Partnerships Coordinator allows me to engage partners, schmooze with key stakeholders, build upon my background in data, and use my writing skills. Is there something from your past (an interest, experience, or lesson) that just makes what you do now make a whole lot of sense? I moved down from NY to do the year-long service learning program called City Year. My plan was to stay in Miami for the school year and then move on to my original destination (San Jose, California), but even early on I felt there was a reason I was sent here. That was seven years ago, and the joke is that I just keep getting hired. 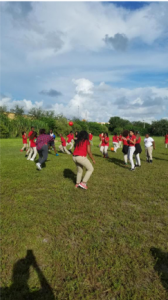 Having worked in a middle school in Liberty City with 7th grade boys, and then seeing them graduate high school a few years ago, I feel the full story of my service to Miami’s communities come full circle. The various jobs I’ve held all fall under this umbrella of service to community, and this is the community I’ve chosen to invest in, certainly for the time being. What would you say to someone considering working on a similar problem? There has to be a fine balance of caring deeply and being involved with clients on a personal level, but understanding how that fits within the bigger framework of a larger problem. Change is slow, but every day one shows up and puts in good work, critical mass builds. What do you think other people should know about your organization? 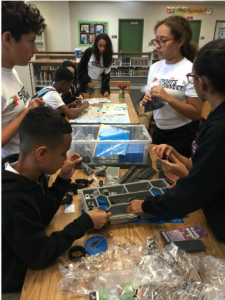 What I would want people to take away from the work that we do is that our young people need our support, and the old adage of, “It takes a village” really does apply. These youth may not be our blood family, but there’s a universal interconnectedness. We are all beholden to one another, and that brings with it a responsibility that I hope others realize. If one of these young people succeeds, we all succeed. What would you tell someone who is thinking about donating money or time? I always love sharing with people that donations go directly toward program costs – my salary is paid through grants. over the next five years? There’s a growing need for these types of services for youth (outside of foster care) who face homelessness whether it be because of poverty, or because they identify as LGBTQ and they were forced out. How has this work changed you? I’m a lot more mindful of my interactions with other nonprofits whose mission I identify with, and I make an effort to really inquire how I can help meaningfully and not just whether I can come in and do what I want. If you would like to support Casa Valentina in their mission, or if you have any questions, reach out to Ingrid Gonzalez at igonzalez@casavalentina.org or (305) 444-0740. The Center for Social Change is proud to have Casa Valentina as a member of the C4SC community. Last year, SMASH began the process of constructing our first affordable housing project, and what a journey it has been! We found land for the project in August, and then by December, we had all of the finances in place. A process that normally takes years was completed in a matter of two months. In addition, this will be the first crowdfunded CLT housing project, and the greatest amount ever crowdfunded on the Start Some Good platform ($325,140). Big thanks to the Center for Social Change, and members like Jed Royer, Tarshea Sanderson, Valerie Hill, Lupe Joy, Robert Carvajal, Michelle Frometa, Lorinda Gonzalez, Lauren Fernandez, Silvio Frank, Bill Burdette, Lucinda K. and the countless others for their tremendous support! When and why did you become committed to your cause? I became committed to the cause of organizing residents around slum and LGBTQ youth homelessness issues because I met the people who were affected by these issues and was shocked by how dramatic their living conditions were. Pestilence, dampness, disease, and danger were way too present for residents of the richest city in the United States. Something had to change, and that change was only going to come if people like myself stopped ignoring the issue and started taking responsibility for it. What attracted you to this cause? I have always been someone who wanted to have a real impact in the world, and since housing is the biggest issue facing Miamians, I knew I would have to be focused on that. Losing friends in the pursuit of an unforgiving goal. Friends have come and gone. Some left because of a difference in vision, others actually died. It never gets easier when that happens. You just have to be strong and stay focused to get through it. What activities do you use to distress?
. How has this work changed you? It’s made me into a much more patient and aware professional. I couldn’t have achieved half of what I have done at SMASH if I were still the person I was a mere 3 years ago. Success comes to those who are prepared to receive it, and I have only recently become somewhat prepared. There’s still so much room for growth and I’m eager to continue growing. Do you see your org making an impact in the lives of those you serve? Absolutely. The housing we build will shelter Miami, and build power among the poor and working class to achieve great things in the future. 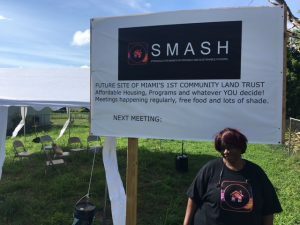 The Center for Social Change is proud to have SMASH Miami as a member of the C4SC community. Devin Browne became interested in starting an organization to assist youth due to his involvement as a Public Allies intern with the Overtown Cookbook Project. He started a mentorship program at Booker T. Washington High School in the heart of Overtown. The funding for the mentorship program ended and he decided to begin a mentorship program involving sports, because sports is one of those things that transcends and connects to all aspects of life. Thus, the nonprofit Sports Konnect was born. 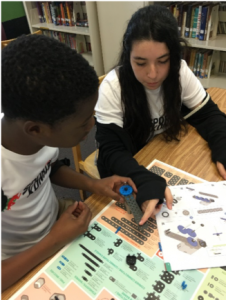 Sports Konnect has several programs connected to Science, Technology, Engineering, Art, Mathematics, Financial Literacy, and Character Building. Devin is motivated by the impact he has seen with students on both sports and the newly connected Science, Technology, Engineering, Art, and Mathematics side of the program. The dreams he has for the non-profit world is for organizations to come out of their silos and partner with each other to provide higher quality, diverse programs. 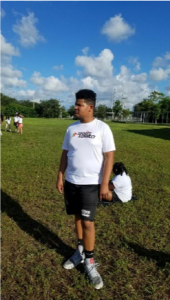 He has been accompanied on his journey by other outstanding partner organizations such as the Federation of Families, Miami Dade County Public Schools, Children’s Trust, and Youth Move. He has been personally mentored by Daniela Levine through the Non-profit Academy, Dave Vernon from SCORE, Dr. Brown of the FIU Medical School, Dr. Rosenberg of Barry University, and his working Board of Directors. His favorite restaurant is Versailles because it makes you feel like you are on an island – in this case in Havana, Cuba. The Center for Social Change is proud to have Sports Konnect as a member of the C4SC community. Our name ‘Soroptimist’, loosely translated from the Latin: ‘Soror+Optimist’, means ‘Best for Women’. In 1921, when Soroptimist was founded in Oakland, CA, many high schools were taught Latin. Women, at least the 75 who joined Soroptimist, recognized the name since women have been joining ‘Sororities’ since 1870. These women suffragettes were owners of their own businesses and were inspired by the 19th Amendment to the US Constitution granting women the right to vote in 1920. Until then, women had not been eligible for membership in many organizations. 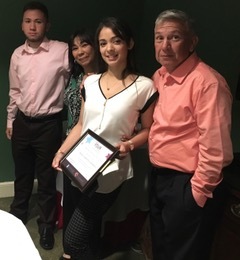 The Soroptimist of Coral Gables/Miami club’s 2018 winner was Irene Herrera, who was born in Nicaragua but came to Miami with her parents and her younger brother. She works part-time, has finished her AA, and wants to finish a BA in Psychology at FIU. The $1,000 check given by our club will help her with her educational dream. Currently, there are over 80,000 club members in 122 countries who work at the local, national and international levels. The Soroptimist mission is to transform the lives and status of women and girls through Education, Empowerment and Enabling opportunities — with a focus on Gender Equality. Our Coral Gables/Miami club works jointly with our Soroptimist Federation in Pennsylvania in the yearly Live Your Dream educational award which has disbursed $30 million to almost 20,000 women since 1972. Please contact the C4SC to reach us if you, or if you know of a woman who would like to apply for a $1,000 educational grant to help her Live her Dream. Each Soroptimist local club is community-based and chooses a project that carries out our mission goals of Educating, Empowering and Enabling women. 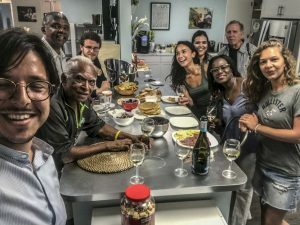 In the case of SI Coral Gables/Miami, we chose to partner with a non-profit ‘Urban GreenWorks’, and together we formed a Horticultural therapy and “farm-to-table” program named Mustard Seed. The aim of our Mustard Seed program is to train women – who have been incarcerated and are living in half-way houses, into productive individuals who can create edible/healing gardens, and who know how to run a shade-house/nursery. In the process, the women acquire self-confidence which aids them in the job market, and they acquire the know-how of the ‘agro-economic’ business. Many of our graduates have been employed by our partner Urban GreenWorks, which specializes in landscape designing. During the last five years, we have trained 106 women whose rate of recidivism is astonishingly low, although some have experienced predictable relapses in their quest of trying to live free from the opioids scourge. 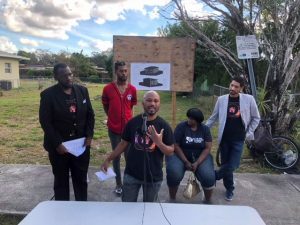 Our club is a perfect example of ‘Live Your Dream.’ Our community gardens in Liberty City, run by Anita – a Mustard Seed graduate, have been noticed as part of the ‘Social Infrastructure’ needed in our cities. We have been invited, among ten organizations, to present our ‘Mustard Seed’ program at the yearly American Horticultural Therapy Association conference, to be held in Denver, October 4-6, 2018. Early in December, we will have a presentation of our Mustard Seed program at the C4SC, to which you are most warmly invited. I became a member of Soroptimist Coral Gables/Miami in 2006, and gladly became a member of C4SC in 2017. Please reach out to us if anything you have read up to now has spiked your interest, and come to our monthly meetings held in Coral Gables. Our club has a dream of ‘competing’ with our sister clubs in the Philippines who have chartered 21 new Soroptimist clubs within the past two years with mostly Millennials. If you were to come and join us as a member, we will together ‘Live our Dream’! For more information about the Mustard Seed Program or how you can get involved, contact Margaret McCaffery at margaret@mustardseedprojects.org , or visit ____. The Center for Social Change is proud to have Soroptimist International as a member of the C4SC community. At the beginning of summer 2016, I led the team that won Startup Weekend Education(SWEdu2016), a hack-a-thon held at FIU bringing together practitioners of technology and business with educators. Then Center Director Lauren Harper offered a free year membership to whoever would win—it turned out to be us. In early 2007, I was still working as a freelance financial consultant in Brickell when I was charged with participating in a fraud and money laundering conspiracy. As a non-citizen, I was denied bond. As a result, I found myself committed to Florida Prisons for the entire five years it took for my appeal to make its way to the Florida Supreme Court—where I prevailed, in part. The winning concept presented at SWEdu2016 had been developed by a team of prisoner students attending an innovation and entrepreneurship class I taught as an inmate facilitator while incarcerated at Everglades Prison. After Congress withheld the Pell Grant from American prisoners contributing to colleges and universities abandoning paper-based correspondence courses—moving-on to online classes—the number of inmates leaving prison with college degrees plummeted. My prison classes’ value proposition is for the secure cyberinfrastructure necessary to restore access to post-secondary education by individuals who must live behind prison walls—ipso facto, without an internet connection. 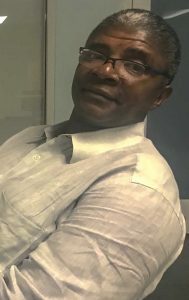 DeJean Myrtil was serving a three-year sentence when he enrolled in my class and proposed the project that we would later come to brand as Liber-P. In late summer of 2016, we turned in our SWEdu prize and began our membership at the Center for Social Change. I often refer to our membership here as a fellowship because it has been a laboratory that has occasioned much personal learning. We could not have accelerated up the learning curve–of all things nonprofit–as quickly as we did without the opportunity for membership. Two years later, we are working with a half dozen newly returned citizens on technological literacy and entrepreneurship. We have started a MeetUp called RiMerge Entrepreneurship (see our Facebook group of 165 members) that has brought our clients together with local professionals and resources. We also participated in the Prison Reform Collective–a 2017 Center initiative led by Dacia Steiner—that sparked the creation of Sacred House for returning women of the LEAP program. It is also through the Center’s founder, Bill Burdette, that my wife has been able to expand her Chef Guetty on Brickell brand to establish her third Brickell coffee cart and first full-service restaurant. Besides serving the social justice and nonprofit communities with catering and meeting services, the help given to Chef Guetty is facilitating the training and employment of additional returning citizens. The Center has connected me to the kind of network that has given me access to opportunities that might otherwise have escaped me. One such opportunity came when I introduced Silvio Pupo to Bill Burdette. That led to my becoming vice president of the Miami chapter of the Government Blockchain Association (GBA, a DC-based global organization) where Silvio is president. The GBA offers various blockchain certifications—we facilitated our first Florida training here at the Center only days prior to this writing. Silvio is also building an impact investing platform and PE fund where I have the privilege to assist. 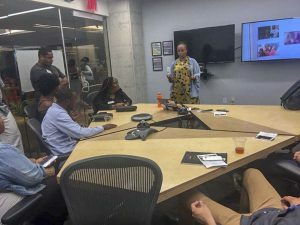 This past summer, we brought a half-a-dozen students from the business schools at UM and FIU for a three-month internship that saw 100% of the participants in attendance all the way to the end. Silvio found the Center provided the ideal space to see and interact with member organizations who are making a significant social impact in the community and the idyllic environment for impact investment banking interns to learn about social entrepreneurship. 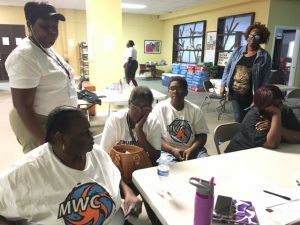 It is likely that relationship will result in even greater collaboration and benefits that could contribute to both the Center and grassroots organizations that make up this community. My two year residency at the Center for Social Change has been richly rewarding. It has been emblematic of our shared ethos: positively affecting a single life (or organization) will have a ripple effect, touching many more. C4SC member Barbara Martinez-Guerrero, Executive Director for Dream in Green shares about the impact Dream in Green has made, and about her role as Executive Director. What is your title but what do you really do on a daily basis? My official title is that of Executive Director for Dream in Green. What I mainly do on a daily basis is to make connections with local and national organizations that have a similar mission to ours in order to expand the program. I also research grant opportunities and build organizational frameworks so that the program stays relevant, organized and on track. Tell us one brief story of how your organization’s work has made an impact? Throughout the 12 years of the program, over 300 schools have taken on different initiatives to tackle environmental challenges. 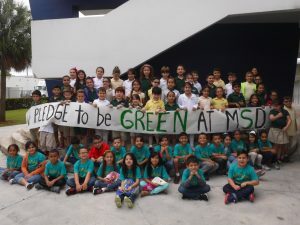 To date, our program has helped to save Miami-Dade County public schools $2.8 million in energy costs, 29.2 million-kilowatt hours of electricity, and helped to offset 44.6 million pounds of CO2 emissions. Through the initiatives our program supports, we calculate that the energy savings would equate to having 2,961 homes off the grid for a year. What is a lesson you’ve learned in your career that you would pass on to others – about your job, your organization’s work, the sector, etc? Although my job responsibilities have changed greatly since I started my career, my passion has not changed. The advice that I would pass on to anyone is to find the thing you are passionate about, be creative about ways in which you can develop that into a career, and to not be afraid to come up with ideas that may seem outside the box. As long as you are doing what you love and have a connection to, the job becomes more of a lifestyle than a job. When I am not working, I am with my two wonderful kids and husband. The time I spend outside of work is really for them. I enjoy going to the beach or the pool with them and all of us love to watch movies. What restaurant in Miami are you dying to go to? With two kids, I hardly have time to go check out any local dining establishment. However, I do love seafood so any restaurant that serves fresh seafood dishes is on my list to visit. What is your favorite floor at the Center and why? I really like the fifth floor with the view of the Miami skyline. I also like the purple wall and new furniture that is decorating the space. I am a very energetic person, but sometimes I need a calming place. For me being able to look at nature and feel like I am part of the city is very relaxing. What online resource or tool do you most use or rely on for your work? Our current programming would not be possible without the Google platform. We communicate with teachers through Outlook mail, but our programming and promotional materials are developed through Google Forms and Google Sites. The Center for Social Change is proud to have Dream in Green as a member of the C4SC community. C4SC member, Susan Gerrish has more than just a passing interest in the oceans and the sea life that inhabit them. Gerrish is the Development Director for SECORE International, one of the leading conservation organizations that protect and restore our coral reefs. They are a global network of scientists, public aquarium professionals and local stakeholders who work together on research and conservation of the world’s coral reefs. “Coral reefs help break up waves that propel destructive storm surges and protect coastal property, they are home to an abundance of sea life and provide economic benefits in over 100 countries around the world,” Gerrish explained. As development director, she inspires interest in the restoration work of SECORE by engaging individuals, corporations, other foundations and conservation organizations to become involved to help in the crisis of coral reef degradation. 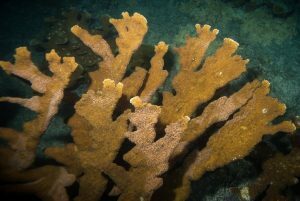 Corals are highly specialized marine animals. “Important reef-building corals such as elkhorn or staghorn corals only spawn once a year, shortly after a full moon, in warm weather. And, to reproduce, corals must find a mate (an egg or sperm) from a different parent,” explained Gerrish. SECORE scientists help facilitate that process. 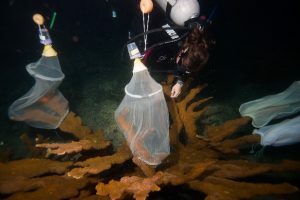 SECORE (SExual COral REproduction) was launched in 2002 by Dr. Dirk Petersen at the Rotterdam Zoo (The Netherlands) whose research on coral reproduction led to innovative techniques for reef conservation. Mike Brittsan, M.Sc., of the Columbus Zoo & Aquarium joined the team a couple years later to bring SECORE to the United States. The organization and its partners are committed to outplanting 1 million corals by 2021 through their Global Coral Restoration Program (GCRP). SECORE International’s work in coral research and restoration is supported by individuals, foundations, corporations, public aquariums, oceanographic institutes, and universities throughout the U.S., Europe, and Asia. For more information about SECORE or how you can get involved in coral reef conservation, contact Susan Gerrish at s.gerrish@secore.org, or visit www.secore.org. The Center for Social Change is proud to have SECORE International as a member of the C4SC community.